CLEARFIELD – A couple is facing criminal charges for allegedly having a stolen vehicle in Clearfield Borough. Police have arrested Christopher Scott Walters, 44, of Alabama for receiving stolen property, false identification to law enforcement, simple assault and criminal mischief and Autumn Rose Hall, 33, of Pennsylvania for receiving stolen property. 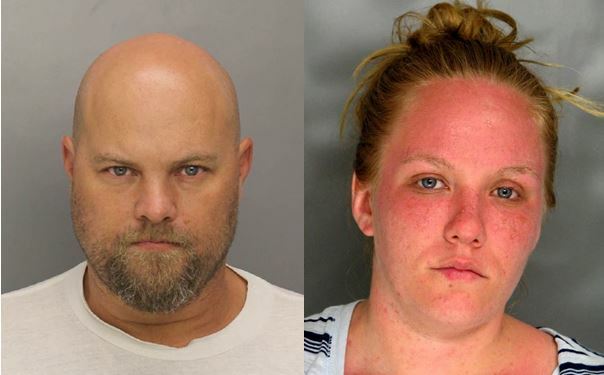 Police say the couple stole a motor vehicle in Alabama and then drove it to East Pine Street in Clearfield Borough. On Friday police were called to an assault in the 300 block of East Pine Street. While police were speaking to Walters, who was a suspect in the assault incident, he supplied false identifying information. He had to be identified by a portable fingerprint scanner. Police learned that Walters was wanted in Alabama for a motor vehicle theft. At the scene, police observed a vehicle parked nearby with Alabama registration and determined it was stolen. Through interviews with several witnesses, it was learned Walters and Hall had exited the vehicle. Its owner told police the couple was in Alabama when the vehicle was stolen July 7. In addition, Walters allegedly assaulted a 27-year-old Clearfield man for complaining about water running from a second-floor apartment into one on the first floor. Walters and Hall were taken into custody and arraigned by Magisterial District Judge Pat Ford. Bail for Walters and Hall was set at $100,000 and $25,000, respectively. Burkett to Stand Trial for Setting Several Fires in Sandy Twp.